Justin's WeatherTalk: Cold Air Delayed???? I made a mistake. While I look back at my Friday post and did account for some of what was happening today- I still brought the cold air in too soon. Sure the polar front is passing through this morning, but my 10+ years in Maryland has proved that the cold air gets hung up on the other side of the mountains and gets delayed 12-24 hours. Downslope winds are the main culprit. They warm up as they ride eastward - down in elevation, and also dry out. Here is the 10AM visible satellite image. 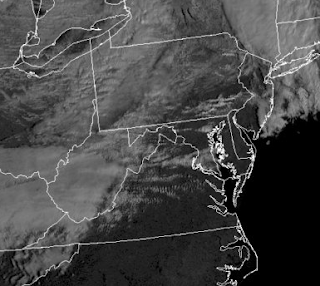 I do expect more clouds this afternoon, but you can see two disting jet streaks seen as cloud lines left to right over Maryland. On the flip side, upslope winds help produce clouds and snow showers, and lock in the cold air. Garret County was down to 22F this morning at 10AM, while Baltimore was in the mid 40s. The vort max, and jet max I showed on Friday is also wrapping up tighter and lifting just north of us. That is why we missed out on the chance of snow. If anything, a lucky flurry back west and north up near the PA line. It will get cold, just wait until tonight to move in . Tomorrow will be a struggle to bet back to 30F while wind chills will be in the teens. Just the first sign of our cold pattern. I am still waiting for a clear view on Wednesday's storm. I will have to push back my assessment until Monday's post. Until then, enjoy this pic. My friend who worked safety and security at the Super Bowl, also took a ride up to Glendale, AZ. 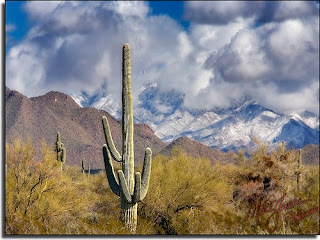 Here you can see a contrast of snow in the desert. See everyone else is getting it this year. Just a matter of time until the wealth is spreads. Do you think we will ever get snow?? I know it's still possible all the way into March, but this winter has been quite dissapointing. Is there reason to hope?